Kate has given up on love—at least for herself. She is both blessed and cursed with the ability to cozy New York town, she has to put aside her own romantic disasters to make her business a success. But when a furious man stalks into her office and accuses her business of being a scam, Kate is given the ultimate challenge to prove herself. Slade puts himself in her hands and asks Kate to find him love. 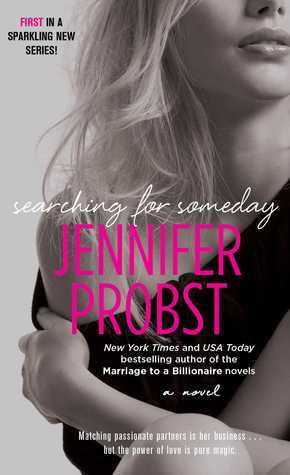 Enraged at his arrogance but stubbornly eager to prove herself, Kate agrees, dedicating herself to the journey of finding him love... only to find herself falling for him along the way. Kate owns a matchmaking agency. She also has the touch to feel real love. But she is single. I did like her, but she was so afraid. Then again she seems to be so unlucky and never meeting the right person. Slade, oh no, he was a divorce lawyer. I know! The worst possible thing to be, well at least for someone who puts people together. And he also wants to save someone from their evil claws. But he was a nice guy. Just a bit wary of love. There is passion, banter, and drama, well duh, of course there is the usual drama before they live happily ever after.